This is ostensibly a cancer diary, the story of one woman's journey with an illness. Pamela's cancer first manifested itself while on assignment in a refugee camp on the Chad-Sudan border in Africa. She examines the issues of terminal illness, how we die and different attitudes towards mortality. It also a story of a journalist, her working life, what work means to us and work defines us.Dry-eyed, but often darkly humorous, ""Bad Hair Days"" describes a journey many baby boomers make-working and meeting the other demands of everyday life, minus hair and under the influence of chemo, while, outside the front door, the world seems to be going to hell in a hand basket.Issues covered in ""Bad Hair Days"" include: Euthanasia, Assisted Suicide, grief, chemotherapy, death and dying, world politics, Darfur, Sudan, AIDS, refugees, poverty.It is a very accessible read and will appeal particularly to a female readership, fans of Pamela Bone's, readers who will remember her columns in ""The Age"", those interested in a personal journey of cancer, treatment and recovery. 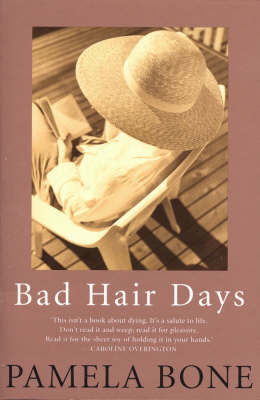 ""But Bad Hair Days"" also articulates larger issues in the world today- politics, the Iraq war, poverty, and general society.